I am glad you are convinced now of the identity of Waasdorp. I am sorry, but I'm not going to post the Van de Velde drawing of the Boymans museum. The museum has published the drawing in their three-book catalogue 'The Willem van de Velde drawings in the Boymans-Van Beuningen museum Rotterdam'. I am in the possession of this catalogue, but I don't feel free to just copy it and publish it in the net. I hope they soon will publish all their Van de Velde drawings on the net so everybody can profit from them. I know some of the Boymans drawings are on the 'Maritiem Digitaal'-site. Have a good look there. I am aware that the lions on the upper stern in many cases face both ways, but this does not seem to be the case with Waasdorp on the Boymans drawing. The print in the book isn't that good though (quite small) soo I'm not absolutely sure. I have a suggestion: make an appointment with the museum to have a good look at the original drawing. I saw some original Van de Velde drawings in the museum and it's an overwhelming experience: the drawings are huge and the detail is magnificent. The reproductions in the book can't match that. Thank you for your answer. May I ask another favour? Do you have an aftercastle photo of the Ghent-model seen from the same angle like the one from Winter from HZ to post here? It would give me a great general impression of the whole after section of the model. Thanks! Sorry, can't help. I suppose I still didn't take enough pictures that day. But here's a question for you. I found this part (see picture) on the Gent-model and I don't have a clue what it is. This is a photo from the Batavia in Lelystad. Given these attachments are authentic things and not just fantasy (I believe this "Batavia" is a totally fictional reconstruction; you cannot just copy the Vasa´s very special warship arrangements to an East India transport ship), your photo maybe also shows such a device for entering the ship more easily. It´s´also slightly decorated (therefore has an important function). From your photo I conclude this clamp being near midships. It´s the proper place. The steps on Batavia are probably an invention of Willem Vos. I suppose he wanted to add a little humor and so he created the figure 'Wakend Oog' (Watchful Eye) to motivate the helmsman to keep his eyes open. I don't think these steps can be found on the VOC-ships of the 17th century. Maybe you're right, and the clamp is for standing on while securing the anchor. Any more suggestions? Anyone? I was able to shoot some pictures through the gun ports, but they don't have the same quality as the ones from the outside of the ship. I had to use a different camera for the interior pictures: a pocket camera, because it had a smaller lense. I will make a selection though and will post one or two. I think the piece of wood you are referring to is an anchor stock. I think Van de Velde made a study of the path of the anchor after it had been hoisted to the cathead. The transfer of the anchor from the cathead to the side of the ship is depicted here in three (faint) steps. Could you give the NMM-number of the drawing you attached? All kinds of twodeckers come up when I type your string. And, by the way, before you start to ask me to identify all unidentified ships in the NMM-catalogue, far better men than me have tried to identify the ships in the drawings. M. S. Robinson devoted his whole life to it. Please don't expect me to do a better job than him. I will give it a try, but don't expect too much. I think we have to face the fact that we simply can't identify them all. Ok, found it: the NMM-number is PAG6195. Twodecker, number of lower gunports: 14, number of higher gunports: 13, number of quarterdeck gunports: 6, number of forecastle ports: probably 3, five lanterns, lions facing outward, high channels, so probably an Amsterdam ship. Main channel deadeye split: 1-3-3-2. 'Zetbord' in the waist perforated for muskets. No arch above the port in the gallery. Comparing it with the shipsportraits in the Boymans-catalogue: the ship is probably Steenbergen. Compare it with the Steenbergen-portrait in the NMM: PZ7265. What do you think? From a shipslist of the Amsterdam Admiralty of 1672: Steenbergen, 1664, 150 x 38,5 x 15. Ships built in that same year with approximately the same dimensions: Waesdorp, Calantsoogh and Deventer. One year later, 1665, Comeetstar and Woerden were built with almost the same dimensions. Waesdorp is in the Boymans-catalogue: main channel deadeye split is different. It's not Waesdorp. Calantsoogh. Do you have a good Calantsoogh-drawing? Deventer is in the Boymans-catalogue: low channels. It's not Deventer. Comeetstar is on the Kijkduin-painting in the NMM and the Scheepvaartmuseum: can't tell from this painting. Do you have a good Comeetstar-drawing? Woerden is on the Kijkduin-painting in the NMM and the Scheepvaartmuseum (though she was not in the Kijkduin-battle): high channels. This is a candidate too. Happy hunting! Please keep me informed about your progress. Here's the promised picture of the interior of the STAM-model. Taken from the starboard side through a gunport. Lower gundeck. Riding bitts on the right. Thank you for this great picture of the interior! Do you have others? Here´s the best depiction of Comeetstar, I could find. The NMM-Number is PAJ2439. Of course, one recognizes the double slingerlijst, but beyond that? At least it´s a possibility. The same goes for Woerden (Texel-Battle-Painting). I know nothing about Callantsoog. As for Steenbergen, wasn´t she built in 1671? Our drawing is probably earlier. This ship also has only six gunports on the halfdeck (like the Reigersbergen; NMM PAH 3853); Steenbergen has 7 (NMM PAI7265). Or it is just hasty drawingwork? I fear, there will never be absolute certainty. The carvings on the roof of the sidegallerie are very elaborate, like on Gouda or Reigersbergen. So, I simply cannot say with any certainty. I have another question, Jules! I have a really great dutchwritten certer on copies of a 160/40/15 Amsterdam warship of 1664 in my possession. It is very obviously a personal document of a shipbuilder, full of very interesting details - the mainframe is given up to the uitwatering - not an official contract. It was published in 1925 by R.C. Anderson in the "Mariners´s Mirror" 14, p. 158-162. It was transskribed by a Commander H. Börjeson from the Swedish Archives (no indication, which archives; maybe Fred knows something about that H. Börjeson?) and sent to Anderson. He translated it into English and commented it with footnotes. I really think, this document should be made known to researches and modelbuilders. Do you think, there could be Copyright issues? After all, it´s from 1925! Should I post it here? About the identification of you drawing. That's my point exactly: the ship on the drawing in the Boymans-museum is surely Steenbergen, it's a view from behind, and... that drawing shows six gunports on the quarter deck, not seven. About the year of building of Steenbergen: I got my information from an official list from 1672 of the Amsterdam Admiralty: 'Lijste van de scheepen resorterende onder Het Ed: Moo: Collegie ter admiraliteijt residerende binnen Amst.' which is in the archives of the Rijksarchief in Den Haag. In this list Steenbergen is listed as being built in 1664. The Boymans-catalogue gives 1671 though, probably based on an inscription on the upper transom of a drawing that is not reproduced. If this inscription represents the building date...? As you may have noticed by now, to figure out every drawing Van de Velde ever made is a difficult job. I wish you all the best with your future investigations. I just found some interesting details in your GM-photos. Do we have here a cover for the oval shaped hatch down to the halfdeck? I always wondered in this HZ-model-photo about what looked liked just a shadow. But isn´t it also such a cover for the hatch? Is there a latter attached under it on the Ghentmodel? And the little quadratic grating on this deck - is it made of a metal? Winter states so for the HZ-model. Thanks. The questions just keep on coming hey? The Gent-model has two hatch covers. These are semicircular on the inside and square on the outside. They fit on top and inside the hatches that have that same shape: semicircular on the inside, square on the outside. The hatch covers are painted red on the inside; probably by Birnie. So this is different from the Hohenzollern model. That model has ellipse-shaped hatches with rectangular hatch covers. The hatches can be seen on Winter's drawing 'Tafel II'. On this drawing you can also see the steps of the ladders which Winter describes. The Gent-model does not have ladders underneath the hatches. I suppose they should be there, but went missing. The grating in the deck of the Gent-model is not as far aft as in the Hohenzollern-model. 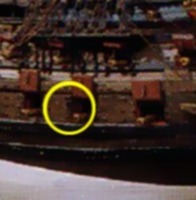 It's right behind the mast, above the helsman's position. The grating is made of wood, not of iron.